This week Rysio and I went on a whirlwind tour of Ottawa. We arrived at my godparents' house late on Sunday evening. We were pretty tired but after a quick visit, we decided to go out on a magical adventure. My cousin had a sweet connection, a security guard at the tallest building in town. We quietly snaked through parking garages, hallways, up elevators and terrifying maintenance ladders. When we arrived on the top of the building it was dark, windy and there were thousands of warm yellow and orange lights twinkling around below us. We saw parliament, the national gallery, a chateau and tiny cars and people. The heights were dizzying but it was so amazing to be higher than anyone else in the city. Afterwards we fixed our craving for Pho at a small place in Chinatown, it was so delicious! On Monday we got up relatively early to fresh and yummy homemade muffins that my godmother had baked that morning. We decided to go downtown and soak up as much of the city as we could during our short time there. The most obvious choice was a tandem bike ride along the Rideau Canal! Neither of us had ridden a tandem bike before so we were obviously grinning like fools the entire time and talking about how jealous everyone surely was (we totally didn't look like tourists at all, not even a little bit). We walked over to look at Parliament and went inside for a while. I'm sure the security guard at the metal detectors and x-ray scanners was mildly amused by Rysio's wallet, it reads: Not Fooled by the Government. We decided not to take a tour even though that gained us access to about one stairway, one hallway and two foyers. Rysio decided to write a strongly worded letter to Mr. Harper about our lack of access to the building while I opted to ask the government to continue supporting Parks Canada, the Arts and First Nations, Inuit and Metis communities in Canada. Unfortunately, Rysio's camera was out of batteries so there are no pictures of this trip. I like to think that this little mishap allowed us to experience our mini vacation much more fully because we weren't busy taking pictures. 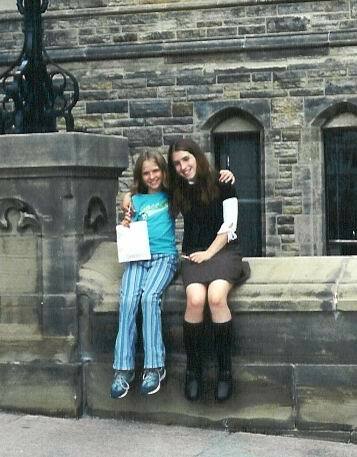 Instead, I will share this old photo of my sister and I when we last visited Parliament together. Rysio managed to survive a bit of shoe shopping that I needed to do for work, then we headed back to my godparent's house for a delicious rib dinner. We had an awesome time and we can't wait to go back and do more. I had my eye on the National Gallery and Rysio was pretty excited to hear that there is a Museum of Space and Aviation. Sidenote: I was promoted to Dining Room Manager yesterday! I'm fairly honoured to be appointed to this position, hopefully things will go well for the next two months. I know this will be a great experience and it will test my organizational skills. Things did go well for you in the dining room champion! !